Researchers have for the first time, developed a smart textile from carbon nanotube and spandex fibres that can both sense and move in response to a stimulus like a muscle or joint. Lead researcher Dr Javad Foroughi from the ARC Centre of Excellence for Electromaterials Science (ACES) explains that the key difference between this, and previous ACES work, is the textile's dual functionality. 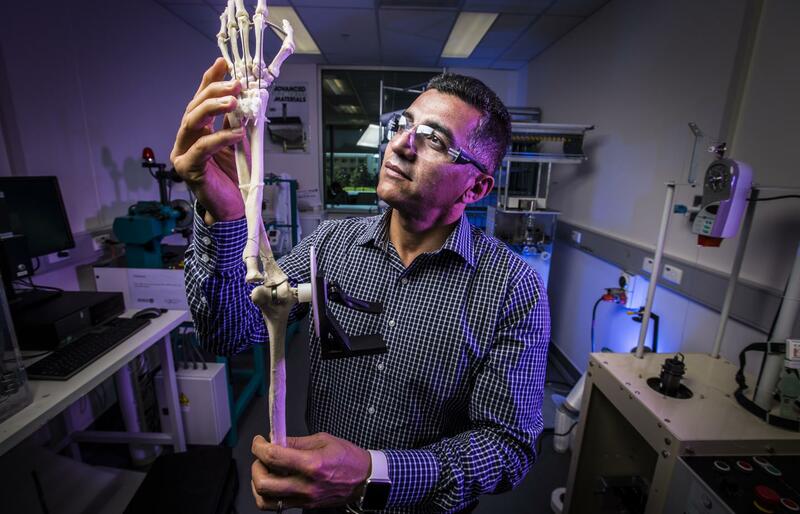 "We have already made intelligent materials as sensors and integrated them into devices such as a knee sleeve that can be used to monitor the movement of the joint, providing valuable data that can be used to create a personalised training or rehabilitation program for the wearer," Dr Foroughi said. "Our recent work allowed us to develop smart clothing that simultaneously monitors the wearer's movements, senses strain, and adjusts the garment to support or correct the movement," he said. The smart textile, which is easily scalable for the fabrication of industrial quantities, generates a mechanical work capacity and a power output which higher than that produced by human muscles. It has many potential applications ranging from smart textiles to robotics and sensors for lab on a chip devices. The new smart textile, described last month in the high ranking international journal, American Chemical Society (ACS Nano), was made possible through collaborations facilitated by ACES between researchers at the University of Wollongong and the University of Texas at Dallas. ACES Director Prof. Gordon Wallace said the breadth of expertise required to enable fundamental materials science discoveries and their application into practical structures is enormous. "It can only be done in a reasonable time frame within a culture like ACES that encourages the forging of appropriate research alliances," Prof Wallace said. "Materials that can provide both sensing and response capabilities are the holy grail of intelligent materials research. This fundamental discovery will find widespread application," he said. The discovery came three years into Dr Foroughi's ARC Discovery Early Career Research Award (DECRA) project which aimed to create a new class of smart textile. "Working with world-class scientists Prof Geoff Spinks and United States collaborator Prof Ray Baughman made it possible to create the first generation 3D carbon nanotube knitted smart textile," Dr Foroughi said.